Eew. But the kids loved Alligator Bay (the reptilarium). This is a perfect activity for a rainy day as most of the reptiles are indoors in the warm. Good for the winter too. It's worth mentioning that Alligator Bay is in the shadow of the Mont St. Michel so the more phobic members of the family could go off and see that whilst the others are enjoying a more tropical experience. Outside, depending on the time of year, children and adults can get touchy-feely with some enormous turtles which is a nice experience. In the first section, The reptilarium there is a massive selection of snakes and slimy creatures of all kinds. The display area is well organised and there are all sorts of passages and tunnels for the children to use to get closer to the animals. 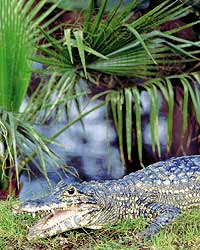 Once you leave the smaller reptiles behind you can go to the Alligator park which is indoors. You will probably smell the alligators before you see them but you get used to that quite quickly and you look down into pits where there are ponds with beaches for the alligators to languish on. Try to get there at feeding time to make it more exciting for the kids. It won't take a whole day but for the entrance fee (approx 7 euros each) a good afternoon's entertainment.